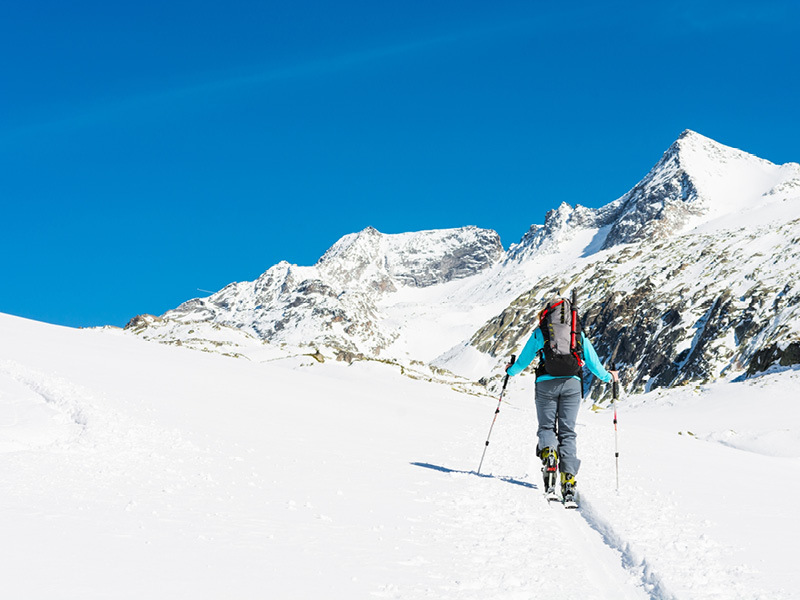 Ski touring is certainly the ultimate winter mountain experience. As equipment has improved and become lighter, touring is now accessible to everyone. There are countless tour options, depending on you level of fitness, skiing skills, and mood of the moment ! Ski touring is a perfect means to be into the wildnerness and serenity of the mountains before skiing down a powder slope all alone. “Climbing skins”, attached under the skis, allow the skier to walk up to the top. They are then removed for the descent. Touring bindings are also specially designed for both walking and skiing. (The equipment is available for rent in ski shops). This frees the skier from the limits of ski lifts. After a pleasant climb (20 minutes to several hours) in breathtaking scenery, a magnificent run awaits you and your friends or family. It’s an unforgettable experience. 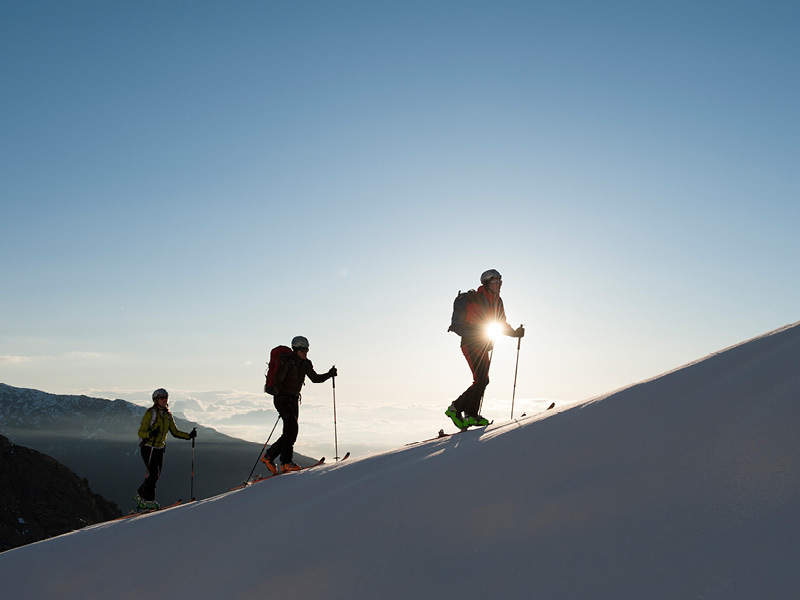 Want to join a group of other skiers for a day of ski touring with one of our guides ? Sign up for a group outing ! Joining a group outing allows you to enjoy the experience of ski touring in the 3 Valleys at the best possible price. However, please note that various levels of ski may be found in the group and that the experience may not be as intense as when hiring a private guide. Attention: groups will be organized with skiers exclusively or snowboarders (splitboards) exclusively but we will not organize mixed groups ski-snowboards. Thank you. It’s decided, I am going to try this! You would like to try touring, but you don’t want to slow down your friends? Or you are concerned that a full day would be too much for you? This HALF DAY with your guide will give you the keys to ski touring, or at least the rudiments to begin! Even though it is easy to find a route, it is considerably more difficult to analyse the snow pack. To choose between this or the next slope. What type of fresh snow fell overnight? Has this route been skied? If there are already tracks, is this a sign of the route’s safety? Should I go, today? Isn’t it dangerous? While answering all of these questions, your guide will choose the best runs for you! What type of equipment (rental from sport shops) should I choose? How do I use it correctly? We are here to help! After checking that all avalanche beacons are functioning, we will take you far from the crowds – there where nature rules, to make your own tracks! At the guide’s steady rhythm, you will learn the very essence of skiing! Ski touring! And without wearing yourself out. 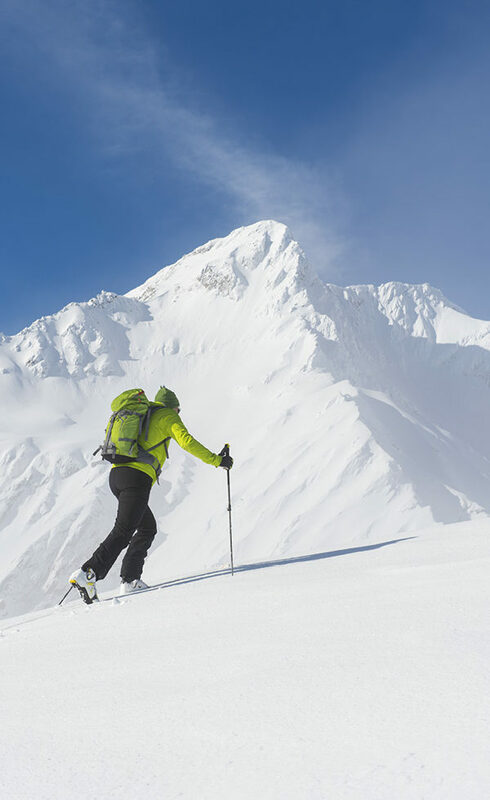 In practice : Your guide will supply safety equipment (avalanche beacon/shovel/probe/small backpack). A 3 Valleys lift pass and insurance are required! Guaranteed departure from 3 persons, or 2 pers with overcost. I would like to try off-piste and touring but I would like a “little” walking and a “lot” of skiing (30mn to 1h hikking) ! The 3 Valleys offers a vast playground of on-piste skiing, but there are also many remote areas that can only be reached by ski touring. From the top of the lifts, we leave the pistes behind and stick on our skins to explore further. 30 minutes to 1 hour 30 minutes of moderate effort are enough to reach fabulous, calm and remote areas where we can make tracks at our own rhythm, far from the agitation of the pistes. This formula is intended for skiers with an ability of class 3 and above who want to try touring, or those who have some experience but who would like to join a group to share their enthusiasm and learn more. This group outing is organised by the Meribel bureau des guides every Wednesday and Friday for 3 participants or more. To ensure the best service, we limit the groups to 6 persons per guide. You can easily rent modern touring gear in Meribel (wide touring skis + skins + knives). Tell us in advance if we need to provide safety equipment. In practice : We will meet at 9:15 am at the Chaudanne where we will check safety equipment (Beacon, shovel, probe), which the guide can supply if you do not have it all. Depending on the snow and weather conditions, the guide will choose the best sector to explore to ensure that this tour will be a success. In the early afternoon a picnic, or a quick meal in a restaurant, will provide a well-earned pause. The return to Meribel will be more relaxed, on or off-piste, depending on the state of the troops. We should arrive back at Meribel around 4:00 to 4:30 pm. I’ll treat myself to a day with a guide to ski the classic routes. You are on top form! Conditions are good. All lights are green! It is the moment to head to the Grand Perron des Encombres to make big turns on the north face. Or climb to the summit of the aiguille de Peclet by the glacier and descend the west face that overlooks Val Thorens. Perhaps even the canyon couloirs of the fenêtre de Portetta which allow access to Pralognan, while admiring the sublime view of the Grande Casse and the Aiguille de la Vanoise. Easier to access, the sunny slopes that descend to Modane might be good… And there are many other fabulous descents accessible from the 3 Valleys and the surrounding resorts. The group will be limited to 3 persons per guide for these routes. Ski level required : advanced to expert skier, off pist experience required. A 2 hour lesson in basic touring techniques, on a designated run. You have heard about it, you have been assured that it is fantastic, but you have never taken that first step? Now is the time to try touring! Join a group of enthusiasts and benefit from the experience of the Meribel guides bureau. They will give you all that you need to know to immediately enjoy this sport that is attracting more and more people. You will find that it is a very pleasant way to stay in shape, and to get off the beaten path (without necessarily leaving the ski area). Meribel, a leader in the sport, has created two pistes exclusively for touring. Everything has been done to make it easy. Notably we have partnered with two sport shops that will rent you modern, light equipment (a “detail” that really makes the difference in this sport!). In less than 2 hours, you will already have a taste for ski touring, and you will certainly return for more! Activity every Monday from 04/02/2019 to 15/04/2019 from 5pm to 7pm. Guaranteed departure from 2 persons. One of our mountain guides, exclusively booked by you or your group, will guide your party for a great day of ski touring. This is the better option if you are a good to excellent skier. I am a very good skier and I want to ski some amazing runs ! West face of Peclet, Brèches de Portetta, Aiguille du Fruit north couloir, Amande’s couloir,Grand Perron des Encombres north couloir, Sérac’s couloir, Roche nue’s couloir, Bonmartin’s couloir and many more, the possible itineraries are limitless! Our guides will show them all to you: enjoy with us the beauty of the 3 Valleys ski area! On powder days, your guide will plan your day to optimise fresh snow until you are satisfied! Panoramas, mythical summits and moments full of emotion will leave you with unforgettable memories and the desire to do it all over again – as soon as possible. The guides of the Meribel office can also take you on the major routes in the other ski areas of the Tarentaise and beyond (La Meije, Chamonix, etc …). Ski level required : advanced to expert skier, off pist skiing experience required. I dream of putting on skins to get off the beaten path ! Yes, escaping from the daily routine is possible! For a long time alpine skiing has been the king of mountain winter sports. But, we must admit, ski touring is the best method for reaching the most isolated spots, and the most secret. You will be quickly seduced by the spirit of “discovery”, by the savage beauty of the wild spaces, which it allows us to access. Certainly, ski touring requires “effort” and “stretching your limits” but it is well rewarded with untracked skiing, a generous quota of unspoilt nature and the strong emotions of discovering new places. Obviously, freedom should not mean the absence of safety! Whenever you say “natural environment” there is some risk involved. A certain amount of knowledge is required, and we would go even further and say that some “familiarity” with the surroundings are needed to judge the level of risk on a given route. The practice of ski touring requires, among other skills, a minimum of technique in order to reach the summits safely. If you have any doubt in your abilities, hiring a mountain guide is simply the best solution. Our valley, a vast area, is also spectacular and it is perfectly adapted to this sport: It is simply waiting to be discovered… by you!